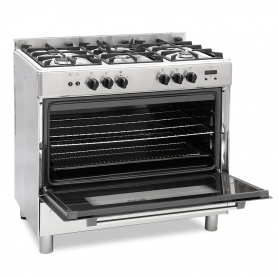 The MR91GOX is a 90cm gas range cooker with five gas burners including a wok burner. In line with the rustic but minimalist look, we have included chunky cast-iron pan supports and burner caps. 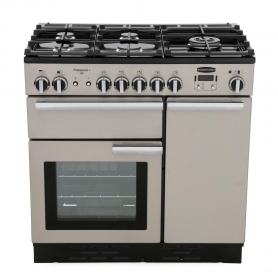 With a large 116 ltr capacity, this range cooker is great when you need to cook for a big family or friends. 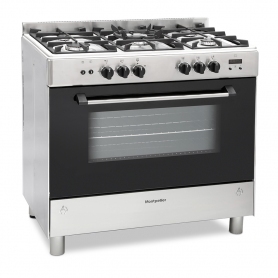 The telescopic rails also make it safer and easier to get the hot food out of the oven by stabilising the racks and holding them securely. 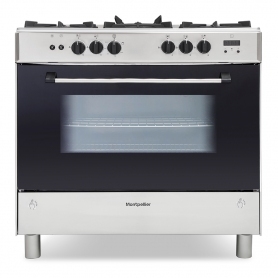 At the bottom, there's a handy storage drawer for baking trays and tins. Just push gently at both ends of the drawer and then pull gently down to show reveal the space.